I don't remember if it was spring, summer, fall or winter when I first heard Pathana Khan's rare recording in late Mian Aslam Ranjha's music library. That was the best collection of rare music in Lahore and I don't think anyone has matched it even today. Sense of time and space vanished when I was half way through Pathana's first kafi Bay rang ranwal deketey. I had gone to Mian Sahib's residence with the poet Najm Hussain Shah, widely known as 'Shahji'. After that day, Shahji and I were frequent visitors to Mian Sahib's house in Pakki Thathi, behind Samanabad. Then Pathana Khan of Kot Addu was unknown outside the Saraiki belt and had earned some fame for singing Bulleh Shah's kafi Cheena inj sharinda yar on radio in Multan. It was Mian Aslam Ranjha who introduced Pathana Khan to our group — and to Lahore — and then through Mushtaq Sufi's programme on PTV he was on his way to fame in Pakistan. Mian Aslam Ranjha, a prosperous farmer from Sargodha, was a very handsome man (a rare incarnation of legendary Ranjha), extremely generous and the most committed music collector I have come across in Punjab. He was known for offering any or everything for a rare piece of music. He would travel long distances to remote towns and villages to get these pieces. Whenever we met him he would mention his new pieces of collections and tell us what he had to offer for a particular piece of music. Sometimes it was money and at others it was a buffalo or a cow. In the process, Mian Aslam Ranjha had collected a rare library of music which was comprised of all kinds of music along with azans and naats sung in different ragas and in different regional tones. I don't know what happened to his music library after his untimely tragic death. Before his death Mian Aslam Ranjha had moved to a bungalow near F.C. College and we did not visit him as frequently as before partly due to the lack of time and partly because Pathana Khan had started visiting us in the university on a regular basis and we were able to listen to his ecstatic music in person. But Mian Aslam Ranjha was an unforgettable and celebrated person in this field. Unfortunately he was not given a proper recognition after his death. I hope one day his successors will share his treasure with the rest of Punjab. Mian was very articulate and an acute observer of human character but lonely at heart. Therefore, whenever we visited his home, he knew that we had come to listen to Pathana Khan. However, to keep us longer Mian would play everything else but Pathana Khan. But, when he felt our patience screeched to the limit he would smile and put Pathana Khan on. While immersed in Pathana Khan's taans Shah ji said one day "legends about Tan Sen might not be untrue." I don't remember how Pathan Khan entered our "Rut Lekha" group which was named after a Punjabi journal that we had started publishing in those days. It brought a new crop of Punjabi writers that included Dr. Akmal Hussain and Izzat Majeed. Mr. Hussain Naqi use to print it at his press free of cost. Rut Lekha did not continue but the group members would always gather when Pathana Khan was in town. He, along with his permanent companion Yaseen, would stay with me for weeks in my small abode in hostel no 4 of the New Campus which was allotted to me because I was teaching Philosophy at the Punjab University. Pathana Khan was apolitical but he felt completely at home with our group which was mostly comprised of left-wing activists and idealists of all sorts. At that time Pathana Khan use to sing mostly Kafian Khawaja Ghulam Farid and a few things from Bulleh Shah. Since the group was mostly fascinated with the great poet Shah Hussain, Pathana Khan picked some Kafian and included them in his singing. Maila Charaghan used to be Lahore's major annual event but Shah Hussain had been forgotten as a major poet of classical Punjabi tradition. Only a couple of his kafis sung by Hamid Ali Baila like "Mai ni kehnoon akhan" were popular. The rehabilitation of Shah Hussain's poetical stature was initiated by Majlis Shah Hussain, a group formed by all the major Punjabi writers of that period. The Rut Lekha group played its small role in this regard and was greatly helped when Pathana Khan started singing Kafian Shah Hussain. I must add that a member of our group, Tahir Yasoob was a singer who also played a great role in popularizing Shah Hussain. As a result of Pathana Khan's interaction with our group, he started including many items of poetry in his singing which were mostly sung in central Punjab. Pathana Khan was invited to sing for PTV frequently but he was not invited by most music patrons of Lahore or elsewhere in central Punjab. It was much latter that Raza Kazim did some beautiful recordings of Pathana Khan. Anyhow, once introduced by Mushtaque Soofi on TV, Pathana Khan's fame spread quickly. I don't know if it was true or not but it was widely rumored late Z.A. Bhutto was very fond of his kafi "Mera Ishq vi toon te Iman bhi toon" and used to invite him to hear it. Pathana Khan never spoke much about it. As a matter of fact Pathana Khan was never in the habit of throwing out names of his rich patrons and was always happy and content with groups like ours which was or chose to be penniless. It is another matter that Pathana Khan would still demand his quota of Gold Leaf and offer it to the whole sangat around him. By the time he would leave Lahore, I would have withdrawn my salary of coming several months. But, a few months salary of a lecturer were nothing in comparison to what Pathana Khan was giving to our group. Pathana Khan's reverence for Khawaja Ghulam Farid was absolute. Khawaja Faird was everything for him and he derived all his spiritual strength from him. I have rarely seen a singer who can understand and render poetry as good as Pathana Khan rendered Khawaja's poetry for the audience. His reading style was so clear and properly punctuated that even a non-Saraiki speaking could follow the text and meanings of most words otherwise unfamiliar to central Punjabi ears. It remains the best kept secret that Pathana Khan sung much better when he was unaccompanied by tabla. His earlier recordings at Aslam Ranjha's place were recorded only with the harmonium. In my opinion Pathana Khan was at his best in those recordings. Najm Shah ji also did some recordings of Pathana Khan in those early days and these are also the best of Pathana Khan. Unfortunately, most people have heard commercial recordings in which Pathana Khan is hampered by the intrusion and humble jumble of all kinds of instruments. The only exception and acceptable recording with instruments was done by Raza Kazim. Depending on his mood, Pathana Khan would sing same kafi in different ragas. However, unlike other famous singers he would never brag or mention that he was changing the raga for a particular kafi. It naturally flew from his heart and he always remained oblivious to the technicalities, perfection of his own techniques notwithstanding. Pathana Khan learned music from Amir Khan, a local musician who was a descendent (a nephew perhaps) of Ustad Ashiq Ali Khan. He was not trained as a classical musician and learned musical techniques during his singing at maila gatherings. His singing had absorbed the essence of masses, their aspirations and miseries. Nonetheless, Pathana Khan had a great desire to sing a classical raga and tried to convince Ustad Chote Ghulam Ali Khan to teach him. Ustad Chote Ghulam Ali Khan used to come daily to teach Samina Hussain Syed (Najm Hussain Syed's wife). Samina was one of the best emerging voices in classical singing in those days. Pathana Khan met Chote Ghulam Ali Khan several times at Najm Shah's house and eventually asked him to teach him classical singing. Chote Ghulam Khan would smile at his request and changed the subject. However, when Pathana Khan persisted late Ustad told him that he [Pathana Khan] was an ustad in his own right, in his own style, and need not to get into a new venture. Nah hasey tan khusj hasey, hun hsay mar mukai be-deed hasay nit aid hasay, hun deed khrabat lai be-gosh hasay nit hoosh hasay hun halat hoosh wanjai. Khaie dukh sukh sab dunia dey wah bazi yar wchai [We were in a bliss when we were in state of nothingness It was like Eid when we could not see. Seeing has brought destruction to our being. A mahi mat lag asadi toon tan waich majhain ghin gain Majhian mildian kahin kahin walay, gain mildian sanjh sabhahin (O my love, follow my advice. Sell all the buffalos and buy cows one can milk buffalos rarely while cows are can be milked more often). The diction never appeared even close to Khawaja Farid's. Therefore, I asked Pathana Khan who would have been the author of this dohra? Pathan Khan tried to wriggle out of this questioning but on my pressing he smilingly conceded that it was his own poetry. There are some other dohras sung by him which were his own creation but he sung them in Khawaja Farid's name. Pathana Khan was totally devoted to Khawaja Farid. 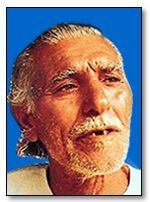 He gave his own deeper meanings to Khawaja Sahib's poetry in his typical style and spirt of singing. For example, Khawaja Farid's kafi "Piloo Pakian ni way" has been sung by Surriya Mulanikar, Hussain Bakhs Dhadhi and many others. However, Surriya Multinakar's composition presents it as a beautiful light folk song while Hussain Bakhsh Dhadhi presents it as a unique classical piece decorated by his unique taans in a typical Ashiq Ali Khan school style. However, it is Pathana Khan's singing of the same kafi that gives a deeper cosmic meaning to it Pathana Khan elevated singing of kafi to a much higher level then his predecessors. He embodied his own unique style in singing and in personal relationship. Many of us will always treasure our association with him. Whenever Rohi will blosom, Pathana Khan will smile through those desert flowers–He himself was the greatest flower of Rohi.